Huge sigh! Now love is most definitely in the air over at the Cutie Pie Blog where our brand new challenge theme is Valentine Cuties. Awwwwwwh, now doesn’t it make you feel all mushy inside? No? What are you made of, shrink plastic!?! 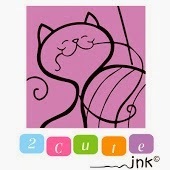 2 Cute Ink digital stamps are my own cute and quirky illustrations used for card making and paper crafting! I love drawing animals and anything cute! I am always looking for new ideas to draw, so let me know what you would like to see! They have a fab shop with some ridiculously cute images and it was so hard to choose just one but in the end I went with Sleeping Turtle, and of course she is dreaming of her true love! Sigh! I used the image twice, shrinking one considerably so that it would fit inside the largest of my Memory Box Cloud dies (thank you Santa!). I printed them out onto Super Smooth card and coloured with Promarkers. Dreaming of her man. Awwwwwwh! I made a stepper card this time and covered it with LOTV Bear Necessities paper. The dies are Lacey Ovals and Classic Ovals from Spellbinders. For information; most of the pearls fell off 5 mins after this shot!! Pop over to the Cutie Pies blog to see the amazing inspiration created by my talented teamies and spread the luuuuuurve! Little Miss Muffet – Challenge #78: LOVE! Awwwwwww so delightful Jane. I love the cute images coloured so beautifully and your design is just wonderful! Lovely card, cute image. Thanks for joining us at the Graph'It Markers colouring challenge. This is adorable, Jane! Cute image and great design! Thanks for joining in on the Little Miss Muffet challenge! Gorgeous card Jane, love the adorable image and fab design. Scrummy papers and details too. So gorgeous Jane.Your image is so cute and i love your pretty design and colours. So creative! Just adorable! What a way to express "love". Thanks for joining in the fun at LMMS! Hi ,the card is adorable,fab colouring and a cute image! Thank you so much for joining us at I ♥ ProMarkers Challenge this week. This is so cute, thanks for joining us at I ♥ ProMarkers. Such a fabulous card, love it...thanks for joining us at A Gem Of A Challenge! Thank you for joining us at Sparkles Monthly Challenges this month. LOVE IT! Beautifull colours and papers. Her dream clouds are so creative and the cute little bow on her head, just adorable. Lovely 'LOVE' Card! Fab image and love the sentiment! Cute little bow too.